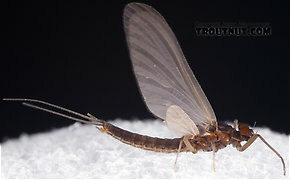 Mayflies may be the most important insects for trout anglers to understand. They are an ancient order of insects, famous outside the fly-fishing world for their fragile beauty and short adult lifespan, often a single day to mate and die. The mayfly's poignant drama attracts poets and anglers alike, but anglers make the most of it. 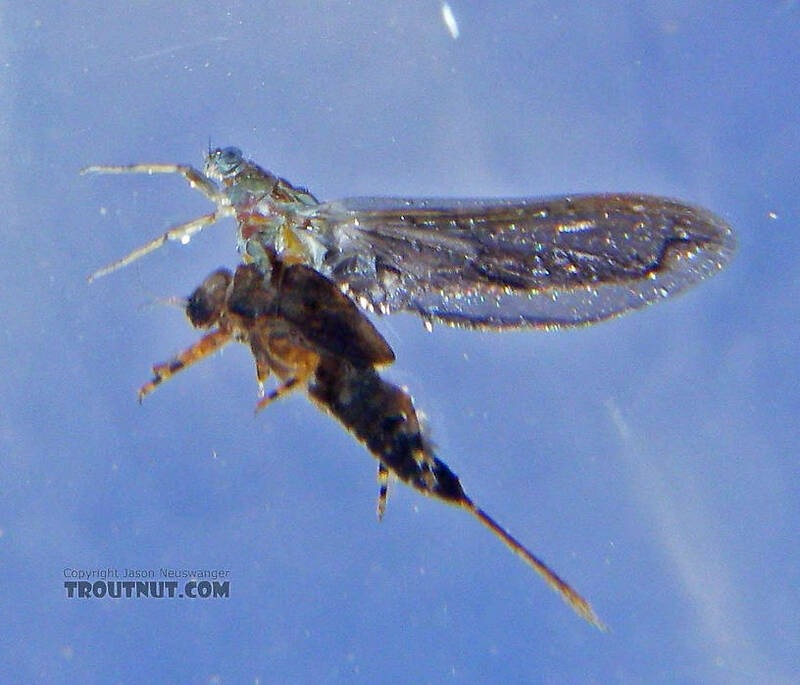 Mayflies live more than 99% of their lives as nymphs on the river or lake bottom, filling many crucial roles in freshwater ecosystems as they feed and grow. They eventually emerge from the water as winged sub-adults called "subimagos" by scientists and "duns" by anglers. Duns evolved to be good at escaping the water, with a hydrophobic surface and hardy build, but they are clumsy fliers. Within a day or two they molt one last time into "imagos" or "spinners," the mature adults, a transformation captured in this photo series of a dun molting into a spinner. They have longer legs and tails, and sleeker, more lightweight bodies, giving them the airborne speed, agility, and long grasp they need for their midair mating rituals. They are usually darker than the duns and have shinier, more transparent wings. They die within minutes or hours after mating. The importance of mayflies comes largely from their emergence and mating behavior. While many organisms assure the survival of their species using individualistic tools like stealth, speed, venom, or parental care, mayflies are famous instead for their "strength in numbers" approach. They coordinate their emergence and mating times (both time of year and time of day) so that they leave their safe habitats and emerge together in large numbers in a very short period of time. This can trigger feeding frenzies in every nearby insect-eater, from trout to birds to dragonflies, but there are simply so many mayflies at once that many luck out and survive to reproduce. These trout feeding frenzies are the stuff of legend among fly anglers, and they also pose one of our greatest challenges, because trout feeding feverishly on a thick hatch are often unwilling to strike any fly that doesn't properly imitate the mayfly of the hour. The duns of each species typically emerge during an hour or two each day for a couple of weeks in the spring or summer, though there are some important fall hatching species. 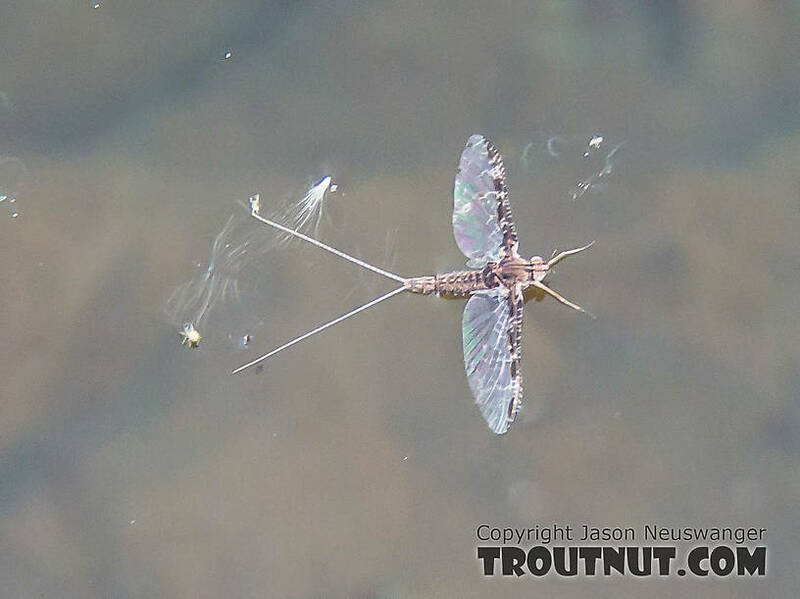 Some species follow more sporadic emergence strategies, and many of these combine to create a sort of "background noise" of miscellaneous mayfly activity on many trout streams throughout much of the summer. This mixed bag of mayflies provides good opportunities for anglers to catch rising trout that aren't too picky. Shuck: The shed exoskeleton left over when an insect molts into its next stage or instar. Most often it describes the last nymphal or pupal skin exited during emergence into a winged adult. ), making flies that imitate these "emergers" especially effective. Some species very quickly take flight when they hit the surface, while others ride the surface for some minutes like little sailboats, a prime target for hungry trout and a welcome sight for the dry fly angler. Cool or windy weather may prolong these struggles and increase the availability of mayflies to trout. Many important species follow completely different emergence patterns. In some, full winged duns emerge on the bottom of the stream and float to the surface. Others swim to shore and crawl out on land before emerging. 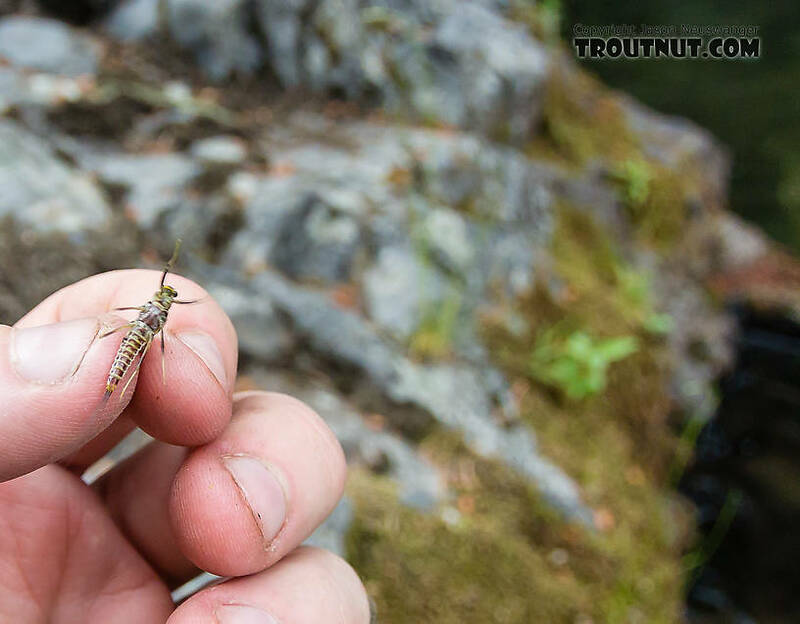 Learning to identify mayflies and associate them with the right behaviors gives an angler an advantage: the ability to make a good guess about which style and stage of emergence to imitate, simply from seeing and recognizing some duns or mature nymphs. 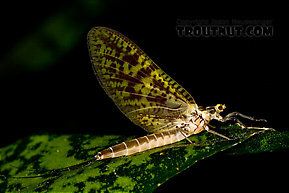 Once mayflies have molted into spinners (imagos), they usually gather in swarms to mate, usually over riffles. When they're done they fall dead, or spent (Spent: The wing position of many aquatic insects when they fall on the water after mating. The wings of both sides lay flat on the water. The word may be used to describe insects with their wings in that position, as well as the position itself. ), on the water in an event anglers call a spinner fall. Spinner falls are usually better coordinated than emergences, because spinners gather in swarms for mating. This means some species with sporadic, unnoticed dun emergences become far more concentrated and important to anglers as spinners. Spinner falls are also usually more predictable than emergences, because so many of them (although not all) take place at dusk, and they are preceded by visible aerial spinner swarms, which may start hours earlier at treetop level and descend gradually toward the water as night falls. Dusk spinner falls often mark the angler's best chance to see a good rise of trout each day. However, like most things in nature, mayfly spinners aren't as predictable as we'd like. Sometimes clouds of thousands of spinners will gather over a riffle in the evening and fly back into the woods as quickly as they came, never falling spent (Spent: The wing position of many aquatic insects when they fall on the water after mating. The wings of both sides lay flat on the water. The word may be used to describe insects with their wings in that position, as well as the position itself.). When that happens, anglers must swallow their disappointment and look for them to finish the job in the morning. Mayfly females face the extra duty of laying their eggs after mating. Many species release their eggs as they fall spent (Spent: The wing position of many aquatic insects when they fall on the water after mating. The wings of both sides lay flat on the water. The word may be used to describe insects with their wings in that position, as well as the position itself.) on the water near the males after mating. Some land on the water, release a few eggs and take off again. Others fly low over the water and dip the tips of their abdomens below the surface for just a moment to release eggs. Still others drop their eggs from high in the air. In one very common genus, Baetis, the females land near shore and crawl underwater to lay their eggs in neat little rows on rocks and logs. Mayfly nymphs or "naiads (Naiad: Naiad is the technical term for nymph used by modern entomologists.)" grow underwater for a period ranging from 3 months to 2 years, depending on the species. Like the stoneflies of Plecoptera, their development follows "incomplete" metamorphosis, meaning they do not undergo a dramatic transformation to adulthood via a pupal stage like butterflies and caddisflies (Trichoptera) do. Their changes are more gradual, at least internally. As the nymphs grow they proceed through numerous slightly different developmental stages called instars (Instar: Many invertebrates molt through dozens of progressively larger and better-developed stages as they grow. Each of these stages is known as an instar. 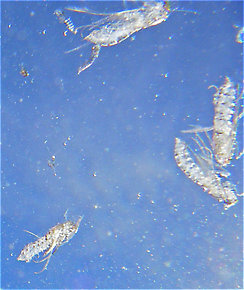 Hard-bodied nymphs typically molt through more instars than soft-bodied larvae. ), between which they molt out of their old exoskeletons and expose new ones. Some streamlined swimmers move like little bullets, faster then fish of the same size, and they swim upstream against strong current without a problem. Others inhabit slow water and use their speed to dart between leaves in the weed beds. Clingers of the family Heptageniidae are typically flat nymphs with strong legs and claws for holding on to rocks. Some have evolved further adaptations for clinging in fast water; for example, the genus Rhithrogena has gills resembling suction cups. There is great variation among the clingers and some species have adapted to slow water. Crawlers come in the most varied forms; they are a catch-all group for "average" families that usually excel at neither swimming nor clinging. The Hendricksons and Sulphurs of the Ephemerella genus are typical crawlers. There are tiny crawlers like Tricorythodes, and there are oddballs like Baetisca. The crawlers in Leptophlebiidae are quite good at swimming, and those in Drunella (especially Drunella doddsii) are quite good at clinging. The distinctive burrowers of Ephemeridae (and the less important Polymitarcyidae) are pale nocturnal creatures which use tusks to carve U-shaped burrows into the river bottom, where they live most of the time. Their long yellow bodies and feathery gray gills make them unmistakable. Their hatches are some of the angler's favorites, especially the giant Hexagenia limbata flies of the Midwest and West or the Eastern Green Drakes, Ephemera guttulata. Entomologists have a similar system, but even their line between categories is a blurry one. Some burrowers swim well, some crawlers cling well, and some families like Leptophlebiidae and Potamanthidae straddle the boundary between categories. If you fish a fertile stream, watch the bottom ahead of you as you walk. 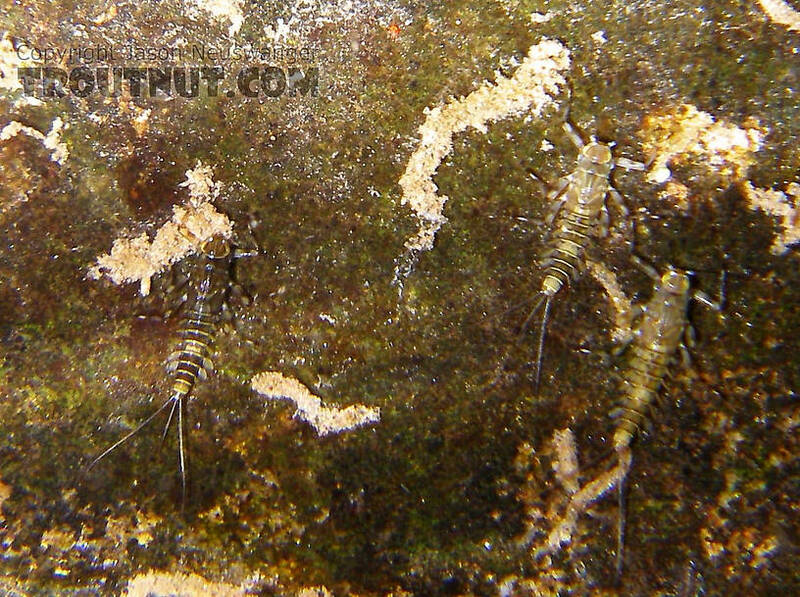 Sometimes, especially in April and May, you'll see lots of mayfly nymphs in front of you swimming out of your way or scurrying to the undersides of rocks. 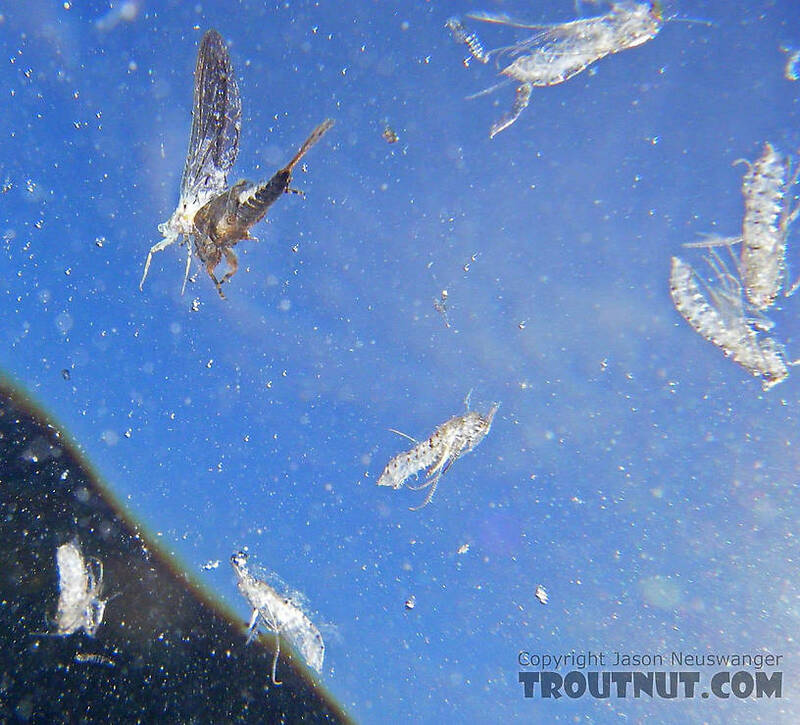 You don't need to be down on all fours with a magnifying glass to see mayfly life underwater. 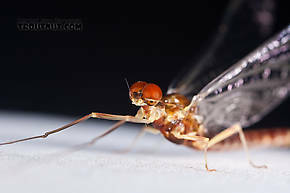 every book/article I read says Baetidae is the most imporant family and Callibaetis the most important genus of mayfly. Why? Does this just mean they are the most prolific? Am I not likely to encounter any other family/genus on a western river? There are 124 more topics. Abdomens: The rear and usually the longest (ten-segmented in mayflies) portion of an insect's body, to which the tails are attached. Instars: Many invertebrates molt through dozens of progressively larger and better-developed stages as they grow. Each of these stages is known as an instar. Hard-bodied nymphs typically molt through more instars than soft-bodied larvae. 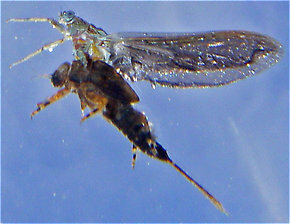 Molt: When aquatic insects with hard exoskeletons (like mayfly and stonefly nymphs) grow bigger, their exoskeleton does not grow with them. Instead they grow a new, larger one underneath and shed the old one when it's too small. This process is called molting. Naiads: Naiad is the technical term for nymph used by modern entomologists.